Aikido is very different than boxing or mixed martial arts and is even different from other traditional Asian martial arts like Karate, Taekwondo, Judo, Jujitsu, or Kendo in several ways. All of these arts focus on the conflict that is created by another person’s attack – the difference lies in your response to the attack. One of the key distinctions is that Aikido is a Do, or way, whereas many of the old-style arts are Jutsu, which means method. In martial arts, the term Jutsu is used in reference to the techniques and strategies used in combat. The suffix Do is used to infer that the focus of training is predominantly on the development of the practitioner’s character. Aikido is the art of taking another person’s attack and neutralizing its effectiveness by redirecting it in a peaceful and nonviolent way. Aikido was born out of a combination of Morihei Ueshiba’s mastery of different martial arts and his philosophical views. Aikido allows a person to deal with an attack or issue while considering the safety of the attacker. The goal of Aikido is a nonviolent end to a confrontation. In our dojo at Aikido in Fredericksburg (and related locations in Stafford, Spotsylvania, Louisa, and Caroline), we have many students that have practiced other martial arts. They come to Aikido for a variety of reasons including safe training, personal growth, and the fact that Aikido lets one calibrate their response to a situation. Here is a brief summary that compares Aikido to other martial arts. If you are sincerely interested in learning more about Aikido, you can make an appointment for a free trial class at one of the Aikido in Fredericksburg locations. Batto Do is a Japanese method of swordsmanship where the sword is drawn and cuts are made in a single motion. Batto practitioners typically have at least two swords, one of which is not sharpened (an “Iato”) and is used for forms practice (“kata”) and one of which is sharpened (“shinken”) and is used for cutting practice (“tameshigiri”). Iaido is the art of sword drawing and is just part of the Battodo system. There are many styles or “Ryu” of Japanese swordsmanship. Toyama Ryu and Nakamura Ryu dojos can be found around the U. S. At our Spotsylvania main dojo, Aikido in Fredericksburg hosts a local Nakamura Ryu Battodo Study Group that is affiliated with the Capital Area Budokai. Self-defense with a sword has lethal consequences. Aikido practices non-violent conflict resolution. In Aikido practice the wooden sword (“bokken”) is used as a practice tool. Boxing is an Olympic sport in which two combatants fight each other using punching strikes for competition and entertainment. Boxing dates back to Greek and Roman times. There are several ways to win a Boxing match: a technical knock-out (“TKO”) where one of the combatants is unable to complete the match, a knock-out (“KO”), a disqualification, or an ending decision by the referee. Boxing is a sport focused on injuring your opponent to the point of collapse or incapacitation. Aikido is not a sport and its goal is to avoid serious injury to both you and your assailant. Brazilian Jiu Jitsu (“BJJ”) is a combat sport that focus on grappling and ground fighting. In Aikido we practice both standing and sitting arts. BJJ was developed based on Judo by the Gracie family and Luis Franca in Brazil. As a sport it has tournaments and medals. There are many rules and certain moves are not allowed. Jiu-Jitsu came to international prominence in the martial arts community in the early 1990s, when Brazilian Jiu-Jitsu expert Royce Gracie won the first, second, and fourth Ultimate Fighting Championships. Aikido is non-competitive and is practiced for self-improvement and effective self-defense. There are some places where Brazilian Jujutsu is taught in the Fredericksburg area but, as of this writing, there are no dedicated BJJ schools. Capoeira is a Brazilian art form that combines elements of martial arts, sports, and music. It was created in Brazil mainly by descendants of African slaves with Brazilian native influences, and is very acrobatic. Due to the quick and complex moves, mostly kicks and leg sweeps, strength and agility is is required. Aikido can be practiced by persons of all ages and physical fitness. Capoeira nowadays is not only a martial art, but an active exporter of Brazilian culture all over the world. The martial aspect is still present and, like old times, is subtle and disguised, leading many non-practitioners to ignore its presence. As of this writing there are no dedicated Capoeira schools in the Fredericksburg area. Hapkido is a Korean martial art that contains both long and close range fighting techniques, utilizing jumping kicks and percussive hand strikes at longer ranges and pressure point strikes, joint locks, or throws at closer fighting distances. Although it shares some of its roots with Aikido in Ju Jutsu, its emphasis on joint-breaks and “finishing blows” makes it quite different from Aikido’s focus on safe conflict resolution. There are no dedicated Hapkido schools in the Fredericksburg, Stafford, Spotsylvania area. Hwa Rang Do is a Korean martial art that was created by Dr. Joo Bang Lee and his brother Joo Sang Lee, both of whom were TaeKwonDo instructors. The name Hwa Rang Do is Korean for “The way of the Flowering Knights”. It was named after the Hwarang, a buddist elite youth order. Due to its roots in TKD, it is mostly a striking and punching art whereas Aikido generally utilizes pins and throws to end a confrontation. There are no dedicated Hwa Rang Do schools in the Fredericksburg, Stafford, Spotsylvania area. Jeet Kun Do (“JKD” or sometimes “ Jun Fan Jeet Kune Do”) is a hybrid martial arts system and life philosophy founded by martial artist Bruce Lee that utilizes direct and straightforward movements. Jun Fan was Bruce Lee’s Chinese given name. Due to Bruce Lee’s short life, and the fact that he officially closed his martial arts schools two years before his passing, there are few JKD teachers with a direct lineage. JKD teaches that the best defense is a strong offense. Aikido is a defensive art. Both Aikido and Judo were developed around the same time. They both originate from old-style Ju Jitsu. There are two principle differences between Aikido and Judo. First, Judo is a sport and it has tournaments and medals. There are many rules that govern matches and certain moves are not allowed. Aikido is non-competitive and is practiced for self-improvement and effective self-defense. Secondly, Judo practice involves one attacker – one defender and the attacks are from the front. In Aikido we conceive that there may be more than one attacker and that attacks can come from any direction. We practice freestyle (jiyuwaza) with multiple simultaneous attacks. The founder of Judo, Jigoro Kano, frequently sent his top students to train with Aikido’s founder Morihei Ueshiba. The Judo school in Fredericksburg used to sublet mat space in our dojo in Spotsylvania. The term jūjutsu was coined in the 17th century, after which time it became a blanket term for a wide variety of grappling-related disciplines. There are many kinds of Ju Jutsu, sometimes spelled Jiu Jitsu. Some of these are traditional forms like Danzan-Ryu, Yagyu Ryu, Yoshin Ryu, or Daito-Ryu. A “ryu” is a family or style. Ju Jitsu is the proverbial parent art of many different martial arts from all over the world; Aikido, Sambo, Systema, Krav Maga, Hapkido, and BJJ all incorporate forms from and consider Ju Jitsu integral to the creation of their art. 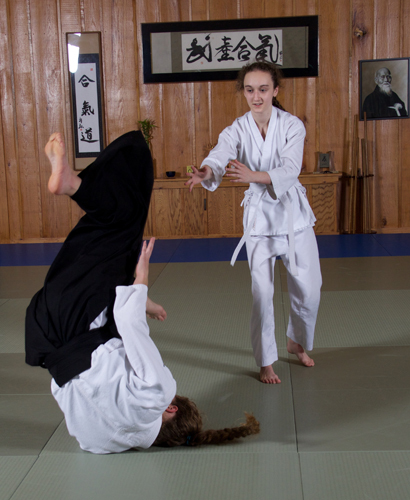 Like Aikido, Ju Jitsu focuses on throws, pins, and small joint manipulation to end a conflict. The main difference between Aikido and Ju Jitsu appears in the method and application of these techniques. Many Ju Jitsu techniques are designed to break bones or maim the attacker. Aikido was intentionally developed to minimize injury while still ending the conflict effectively. “Karate” means empty hand in Japanese. In the 20th century the term was popularly broadened as a catch-all term for the martial arts. Karate, depending on the ryu, or style, can range from traditional to modern. Traditional Karate was developed as a self-defense curriculum in the Ryukyu Islands south of Japan (these islands include Okinawa) and focuses on blocks and strikes. Traditional Karate can be a philosophical art for its practitioners, much akin to other traditional Japanese martial arts like Aikido. Like Aikido, traditional Karate also focuses on kihon, or basic, techniques before moving on to more complex techniques. Traditional Karate styles include Goju-ryu, Shotokan-ryu, and Shito-ryu. There are more modern forms of Karate, like modern Taekwondo, they vary widely in their technical content and many have developed into sport fighting styles. Several Karate styles are taught in Fredericksburg, Spotsylvania, and Stafford, including Isshinryu and Kempo. Along with Karate, the traditional forms of Kung Fu are familiar to many. Kung Fu is something of an umbrella term for many different schools teaching many different types of Chinese martial arts. Some of the most common forms of Kung Fu seen today are Wushu Teams and Wing Chun. Wushu is a competitive form of Kung Fu which focuses on solo or group demonstrations. The terms Wushu and Kung Fu are synonymous and interchangeable. Wing Chun is a martial art which has seen a huge resurgence due to movie stars like Jackie Chan, Jet Li, and Donnie Yen. Wing Chun Kung Fu and Aikido both include fluid movement, relaxation, the use of a center line, and a heavy emphasis on the defensive aspect to the arts. While Wing Chun Kung Fu focuses on strikes and kicks, Aikido focuses on throws and pins. Both Aikido and Kendo are derived from traditional Japanese sword arts. There are two principle difference between Aikido and Kendo. Kendo is a sport. It has tournaments and medals. Aikido is non-competitive and is practiced for self-improvement and effective self-defense. Armor (called bogu) is worn in Kendo practice. In Aikido we use our bare hands and we practice with the wooden sword and staff, which are called bokken and jo. Kendo uses a bamboo sword called a shinai. Aikido’s bukiwaza (weapons arts)includes solo practices, partner practices, and we practice weapons take-a-ways. There are currently no Kendo schools in the Rappahannock area. We at Aikido in Fredericksburg would be interested in hosting a class in Spotsylvania if a qualified instructor was available. Krav Maga is a hybrid Israeli martial art developed from boxing, wrestling, and street fighting. In Hebrew, Krav Maga is literally translated at “Hand to hand combat.” Krav Maga is very fast and aggressive. Krav Maga is used by the Israeli Defense Force. Krav Maga and Aikido have very little in common as the philosophical goal in Aikido is to end a conflict peacefully and without injury. Aikido is a traditional art, rich in philosophy. Mixed Martial Arts (“MMA”) is a relatively new practice that is a combination of fighting styles. MMA is practiced as a sport and even though it has lots of rules and certain moves are not allowed, MMA is often violent. Aikido is non-competitive and is practiced for self-improvement and effective self-defense. Aikido is based on the principle of using minimal force and causing minimal injury. We focus on protection rather than counterdestruction. MMA fighting is often seen on television such as in the Ultimate Fighting Championship. UFC is a pay per view business. There are occasional MMA tournaments in the Fredericksburg area; serious injuries have sometimes occurred. Muy Thai is a competitive combat sport that originated in Thailand and is that country’s national sport. Muy Thai is a striking art which focuses on fist, leg, knee, elbow and foot strikes or thrusts. Muy Thai is very much an aggressive art and was finally codified with a set of governing rules in the early 20th century. Muy Thai has seen a resurgence in popularity outside of Thailand due to famous martial artists like Tony Jaa. Successful practice of Muy Thai relies heavily on the practitioner’s physical prowess whereas anyone of any age can become an effective practitioner of Aikido. Like Aikido, Sumo is considered a traditional Japanese martial art. Professional Sumo wrestler’s lives are very structured and they generally live for their art. Sumo is a competitive art which is focused on driving one’s opponent out of the Sumo ring. Like Aikido, Sumo uses throws which redirect the opponent’s momentum. Conditioning yourself to practice Sumo in its traditional form requires life altering choices, while anyone can practice Aikido at any time. Sumo is not currently practiced in the Fredericksburg area – one would need to go to Japan or Hawaii for serious study. Systema is a pre-Soviet Russian martial art. Systema’s name refers to the approach practitioner’s take to the art; the system is a reference to different systems in the body; arms, legs, fists, etc. Systema focuses on strikes, grappling and the use of knives and firearms. It is meant to be practiced by sparring. There are very few traditional kata, or forms, found in Systema. Systema practitioners typically train in their own way, which leads to a highly individualized art. Aikido is codified and there are traditional ways we teach and practice certain techniques. The ideal of Aikido is a concept called Takemusu, or “spontaneous technique” which is similar to the goals of Systema practitioners. Tae Kwon Do (“TKD”) is a Korean combat art that is the national sport of Korea. Tae Kwon Do emphasizes kicks thrown from a mobile stance, employing the leg’s greater reach and power. As a sport, Tae Kwon Do has rules and tournaments. Much of the TKD practice is focused on sparring. Sometimes protective headgear and hand/foot coverings are used. Aikido is non-competitive and is practiced for self-improvement and effective self-defense. Taekwondo organizations vary widely in rules and standards when it comes to ranks and titles. Tae Kwon Do schools are common in the Spotsylvania, Fredericksburg, and Stafford area – many are in strip malls. The traditional kanji (Asian written symbol) for the phrases Aikido and Tae Kwon Do are very similar. Both Aikido and Tai Chi rely on redirecting an attackers movements in a circular fashion to end a confrontation. They can both be considered “internal” arts. Aikido is more dynamic in that it is practiced with partners right from the beginning whereas Tai Chi practice starts with a structured solo form. Tai Chi is often spelled taiji or taijiquan. The kanji (Asian written symbol) for Aikido and Tai Chi are very similar. Chinese “Chi” and Japanese “Ki” are considered to be synonymous. The taiji forms are practiced very slowly. Application of the forms to self-defense doesn’t typically occur until advanced practice such as tai chi “push hands”. Cheng Man Chin was one of the Tai Chi pioneers in the U. S. He taught a 37-move “short form”. As a teen, Aikido in Fredericksburg’s Chief Instructor saw Professor Cheng teach in Chinatown in New York City. This was among Aviv Sensei’s influences for starting Aikido training. One of Aikido in Fredericksburg’s blackbelts studied Tai Chi with Dai Lui, one of Professor Cheng’s senior students. Aikido in Fredericksburg has hosted Tai Chi classes from time to time at our Spotsylvania dojo which is the local site for the annual World Tai Chi Day practice. Modern Wrestling is an Olympic Sport of which there are two types: Greco Roman and Freestyle. Wrestling focuses on grappling, clinch fighting, and pins. Wrestlers vie for a superior position to the other in order to take him down or pin him for points in a scored match. Aikido is not a sport. Some Aikido in Fredericksburg students have wrestling experience and have found those skills to be useful in their Aikido training. Unlike most other martial arts, physical strength, size, and age have a relatively small impact on one’s ability to effectively practice Aikido since Aikido relies on the redirection of your opponent’s momentum instead of the strength and impact of a punch or kick. Because of this, there are very few physical limitations that would hinder the practice of Aikido. The best way to determine if a school or style is right for you is to try it. Click here to schedule a free trial class at one of Aikido in Fredericksburg’s locations.